Nourish and protect dry skin with L.A. Christine No. 3 Berry Face Oil! Do you use face oil? While many of us are busy trying to combat the oil on our faces, L.A. Christine recently launched a face oil that absorbs quickly, and nourishes and protects your skin! The No.3 Berry Face Oil was created a few months ago by L.A. Christine. Founded by Lea A C Fulton, the oil was born out of necessity due to harsh winters growing up in Scandinavia. She originally developed it for herself and her family, to nourish and protect their dry skin. After friends started noticing amazing results, the demand for her No. 3 Berry Face Oil quickly grew. Packed with three antioxidant berries (Scandinavian lingonberries, Brazilian Acai berry, and raspberries), plus organic acids, vitamin C, beta carotene, B-vitamins, omega-3 fatty acids and oleic acid, this fast-absorbing oil provides your skin with the essentials to fade age spots, improve elasticity, and leave it remarkably smooth. Plus, you’ll be providing your skin with the best ingredients to protect against the effects of the sun. I have been using the oil as part of my evening skin care routine, and I love how easily it absorbs, and how it makes my skin feel, thanks to all the wonderful ingredients it contains. Concerned about using oil on your face? You shouldn’t be! No. 3 Berry Face Oil does not make your skin greasy or break out and it can help to balance out your skin tone. You should give it a try! 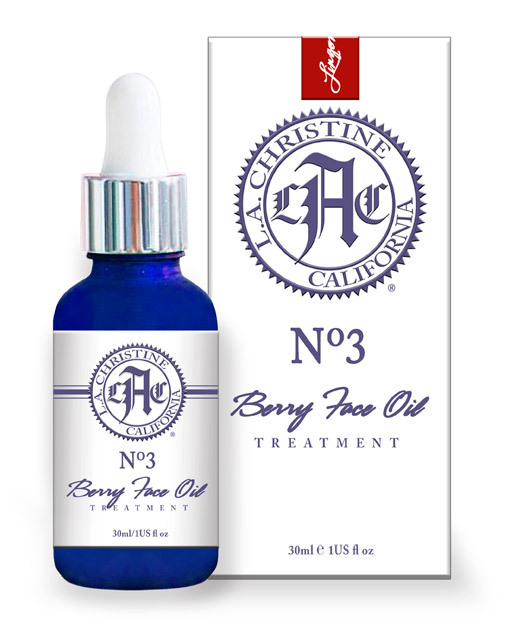 Learn more about L.A. Christine California on her website, and click here to purchase a bottle of L.A. Christine – No.3 Berry Face Oil . Have you ever used a face oil before? How did you like it?